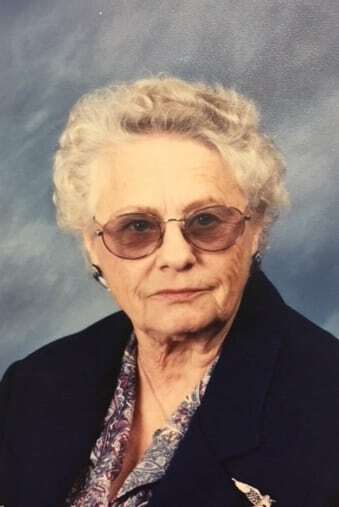 Marian Van Oort Gruchow was born on June 24, 1924, in Sheldon, Iowa, the daughter of Simon and Artie (Mol) Van Oort. She grew up in Milford and graduated from Milford High School. On October 11, 1943, Marian was united in marriage to Lyle Gruchow. The couple made their home in Spencer, Osage, and settled in Traer. Marian and Lyle owned the Skelly Station and the Standard Station in Traer. Marian would help with everything from bookkeeping to working on engines. She was a member of St. Luke Evangelical Church and enjoyed crocheting, quilting, and spending time with her grandchildren. Marian died at the age of 94 on Saturday, August 11, 2018, at Sunrise Hill Care Center in Traer. She was preceded in death by her parents; her husband; a son, Lynn; a grandson, Vince; four sisters, Anna Elvin, Henrietta Green, Christina Sproessig, and Artie Graham; two brothers, Johnny and Christian Van Oort; and two daughters in law, Linda and Robin. Marian is survived by four sons, Dennis (Janice) of Waterloo, Kirby (Patty) of Waterloo, Tim (Sarah) of California, and Keith of Traer; a daughter in law, Shirley of Traer; 13 grandchildren; and 21 great grandchildren.